This is the second post in the Noise Monitoring blog series. As we established in our last blog, hospital noise has been on the rise in recent years, and doesn’t appear to be stopping or slowing anytime soon. It’s even caused some patient dissatisfaction. But how important is reducing that noise? Does it have a significant impact on patients’ experiences? Does it really matter? The short answer: yes, it does, and it matters quite a bit. Recent research suggests that increased noise has a visible, negative effect on patients’ health. A report from the World Health Organization suggests that nighttime noise in hospitals can lead to a variety of medical complications, from high blood pressure to depression. Another study illustrates that perfectly healthy individuals exposed to nighttime noise experience a measurable increase in heart rate. And all that is aside from the lack of sleep which will naturally accompany nighttime noise. If patients don’t get adequate rest, it slows down the healing process, and keeps them in the hospital longer– expensive for both the patient and the hospital, and likely to cause patient dissatisfaction. 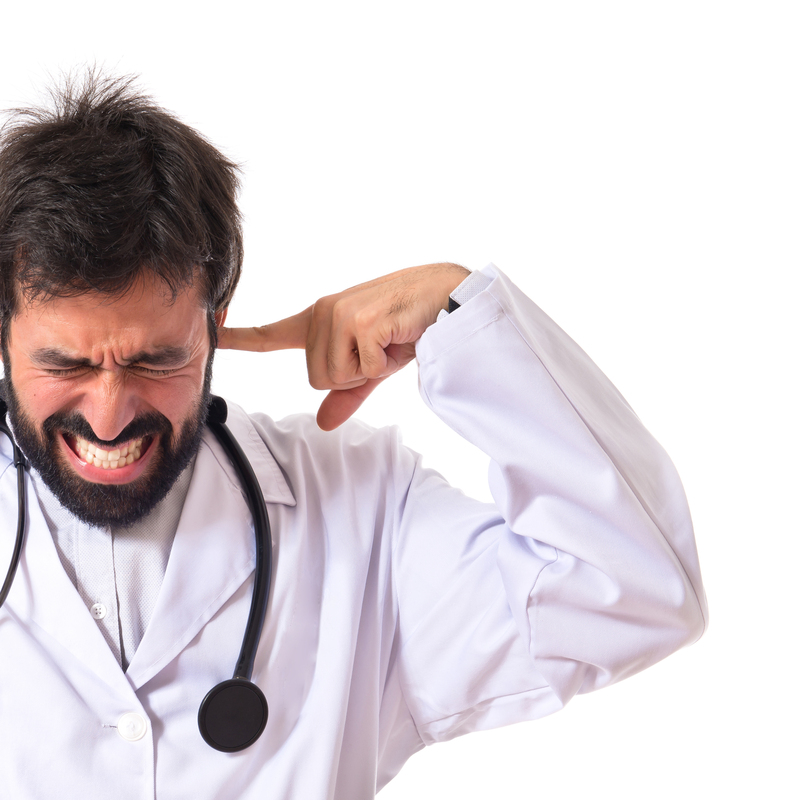 Noise impacts hospital staff, too– and in turn, this can compromise patient safety. Patient alarms are common sounds, and according to research done in 2011, only 3.6 of those alarms actually signal critical events. Because of this small percentage of response-worthy events, hospital staff may be subject to alarm fatigue— they unconsciously tune the alarm out when they hear it go off, which is dangerous when alarms are signaling a critical event. This phenomenon may even have caused the death of a UMass Memorial Medical Center patient in 2011. High noise levels can also cause errors in medication dispensing, simply because clinicians mishear the names of the drug they’re supposed to be administering. 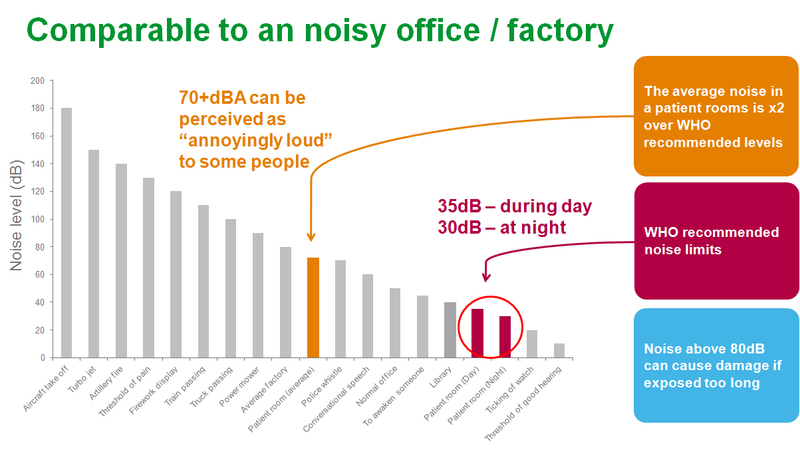 Finally, noisy environments don’t make for good workplaces. Loud, unpleasant surroundings can cause high turnover and low productivity in hospital staff, and leave those who stay irritable, exhausted, or even depressed. Noise reduction will improve staff productivity, reduce turnover, and add to the overall health of medical professionals, as well as that of their patients. As we also discussed in our last blog, patients notice noise when they’re in the hospital. Research presented at the 2011 ASHRAE Winter Conference shows that a whopping 42% of surveyed patients— almost half— reported that they were dissatisfied with noise levels during their hospital stay, and a majority of noise complaints came from noise inside patient rooms. Responses like these inevitably lead to low levels of overall patient satisfaction, and illustrate that even when it doesn’t create direct safety and care issues, noise is a problem for patients. Sticking to the World Health Organization’s recommended levels of noise could go a long way toward creating a friendlier, more healing hospital environment. According to these guidelines, background noise levels in patient rooms shouldn’t exceed 30 decibels during the day or at night, and transient sounds shouldn’t fall above 40 decibels. Hospitals should be places of safety and healing, not places where patients’ health might actually decline for easily preventable reasons. Working toward noise reduction will improve patient satisfaction and care, improve hospitals’ ratings and effectiveness, and transform the environment from one of high stress and loud noises to one of healing and peace again. Read in more detail about the problems associated with high noise levels in hospitals in our noise monitoring white paper. Have you experienced high noise levels in hospitals? How did they affect your experiences? Tell us in the comments below! I tried to download a copy of your paper. As a member of the FGI Guidelines, Acoustical Working Group, I am interested in who authored the paper. Did you run into an issue downloading the white paper? If so, I can send it to you privately. Myself and our solution architect, Chris Roberts authored the paper. You can reach me at estelle.schweizer@schneider-electric.com.